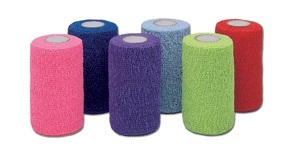 A latex free cohesive bandage with EasyTear patented technology used to secure, protect, compress or support. Easy to apply and remove and comes in a variety of colors. Soft and strong so it will not slip while delivering 12 lbs tensile strength. Controlled compression that will not constrict. 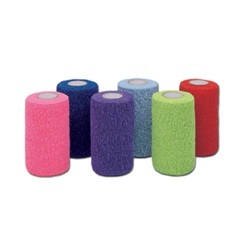 Nonsterile bandages measure 1 inch by 5 yards and come in a variety pack of Neon Pink, Blue, Purple, Light Blue, Neon Green, and Red. Self-adherent and made of synthetic rubber elastic. Comes in a case of 30.